The is a delicious healthy winter meal. The sage is a hit with the squash and goes well with the pork chops. I somethimes like to buy a bag of baby kale to substitute in this recipe. Heat oven to 400° F. On a large rimmed baking sheet, toss the squash with the sage, 1 tablespoon of the oil, 1/2 teaspoon salt, and 1/4 teaspoon pepper. Roast, tossing once, until tender, 30 to 35 minutes. When the squash has cooked for 20 minutes, heat 1 teaspoon of the remaining oil in a large skillet over high heat. Season the pork with 1/2 teaspoon salt and 1/4 teaspoon pepper. Cook until browned, 3 to 5 minutes per side. Transfer the pork to the baking sheet with the squash and roast until the pork is cooked through, 6 to 8 minutes more. Meanwhile, return the skillet to medium heat and add the remaining tablespoon of oil. Add the garlic and cook, stirring, until fragrant, about 30 seconds. Add the kale, 1/4 cup water, and 1/4 teaspoon salt. Cook, tossing the kale and scraping up any brown bits on the bottom of the skillet, until the kale is tender, 5 to 7 minutes. 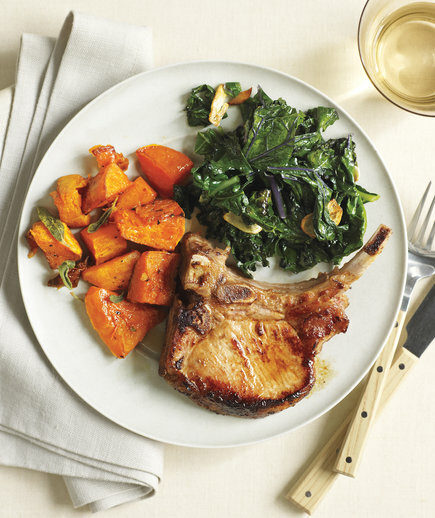 Serve with the pork and squash.